Home » Vietnam Travel » Vietnamese Food » Stir-Fried ‘Pho’ – Pho Xao – Why & Where Vietnamese People Enjoy It? ‘Phở’ must be one of the most famous Vietnamese dishes in the world. People from different cultures enjoy a bowl of ‘phở’ with hearty broth, tender beef or chicken, and soft noodles. Vietnamese people eat ‘phở’ on a daily basis, from morning to midnight. There are many street food vendors and restaurants where have ‘phở’ in their menus. And, in this article, we want to introduce ‘phở xào’, which is a bit different from the noodle soup, the ingredients, the ways to process this dish as well as some of the best ‘pho’ restaurants where you can enjoy this unique dish. Want more details and information about ‘pho xao’? Let’s check out with us! Stir-fried ‘Phở’ is very popular in Vietnam, not just in Hanoi. It is enjoyed by people all over the country, from urban areas to the countryside. 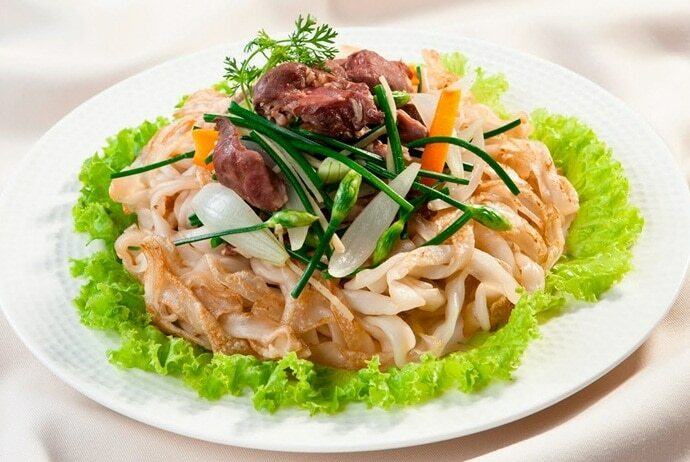 The soft noodle combines with the fresh, sweet taste of thin, well-marinated beef slices (or chicken), as well as the fragrant, juicy green veggies make this dish one of speciality of Hanoians from the past until now. Actually, it is more simple and quicker to make than traditional noodle soup. A plate of stir-fried ‘pho’ can be made in just 15 – 20 minutes. Typically, a plate of stir-fried ‘pho’ with beef contains fresh noodle – ‘phở’, beef and sauce. Besides, it can have oyster mushrooms, onions, juicy seasoned tofu, etc. Pho noodle soup is not different from stir-fried ‘pho’. 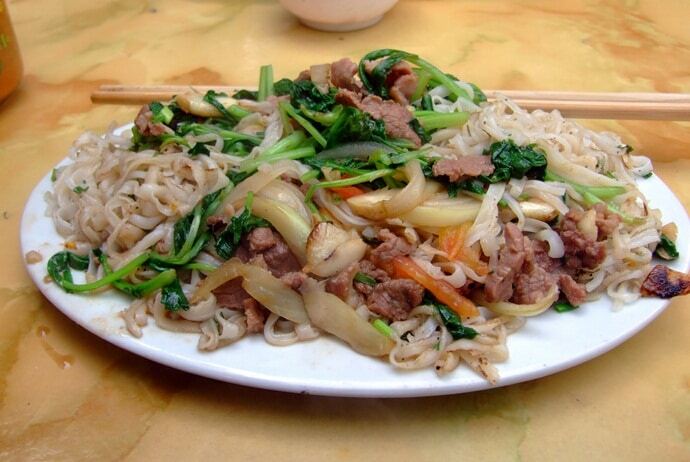 Both of them include rice noodles, beef, and green vegetables. However, stir-fried ‘pho’ does not use the broth; instead, it is fried in a pan. 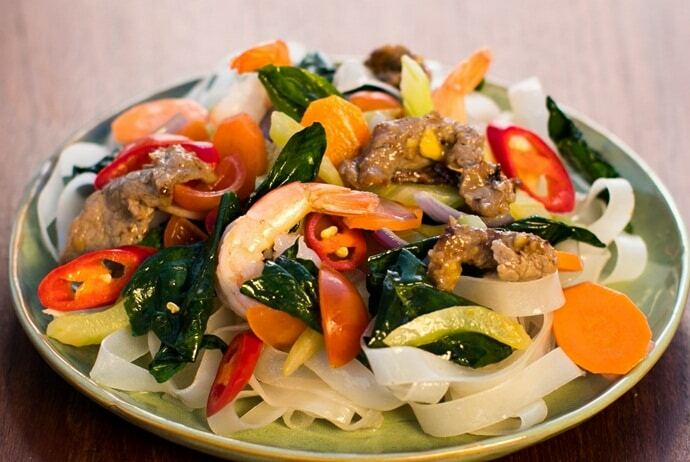 Stir-fried noodles are nutritious, delicious and very attractive. There are some restaurants where you can enjoy stir-fried ‘pho’ in Hanoi. Each ‘pho’ restaurant has a different style, but all of them are always packed with customers. And, here are some of the best ‘pho’ restaurants where you should visit to enjoy this unique dish in Hanoi. This ‘pho’ restaurant is not easy to find, but it has been very famous in this area for a long time. So, if you love the stir-fried ‘pho’, you should not skip the pho shop at 11 Hang Buom Street. It only sells from 7 p.m, although on the nameless sidewalk, it is very famous in Hanoi old quarter with many locals and foreigners to eat. The secret of this restaurant is that before fried with oyster sauce, the beef is covered with a thin layer of powder. 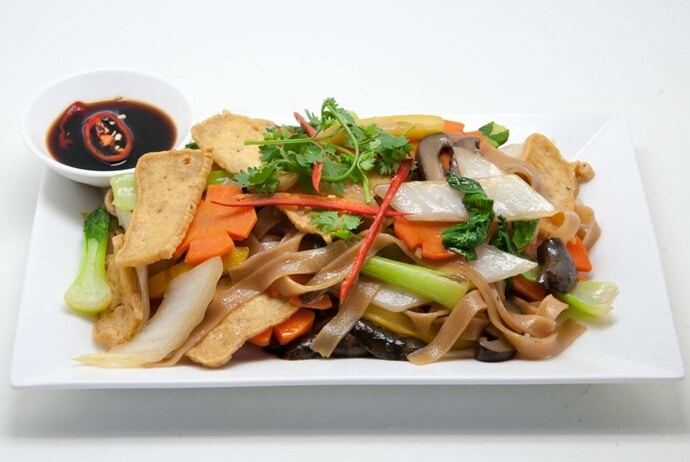 Also, the rice noodles are not too bold, and consumers can add soy sauce, chili sauce and fish sauce for taste. 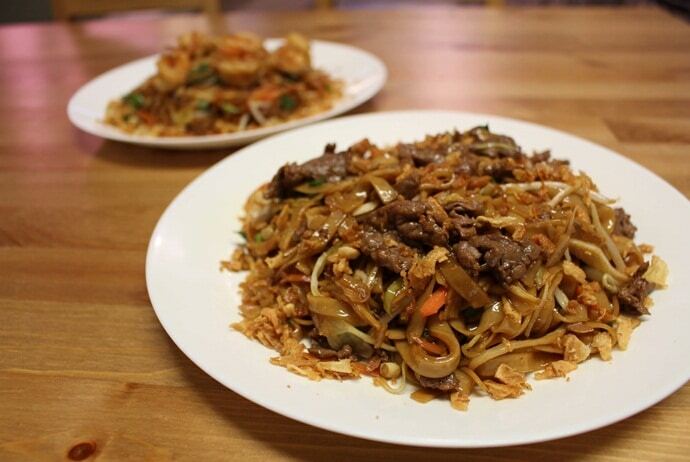 It only specializes in stir- fried ‘pho’ with beef. If you are looking for a little dry ‘pho’, then the flavor here may be very agreeable to you. 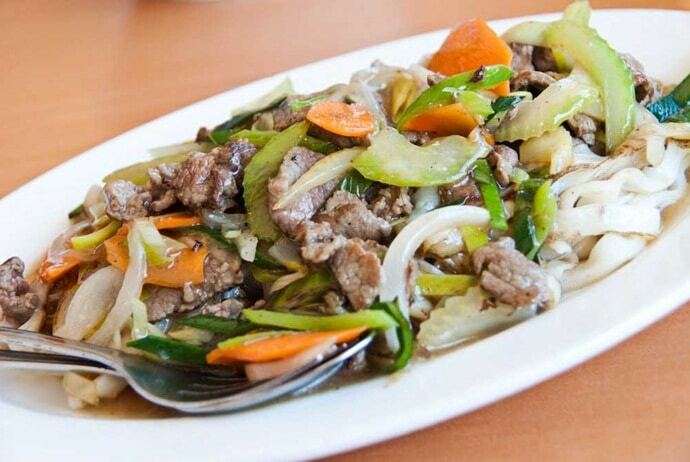 The meat is well- marinated, so it is sweet and crispy, and then it is mixed with fried green vegetables. The noodles are also fried here, but it still remains soft. However, the disadvantage of stir- fried noodles here is that they are soaked in oil too much. Therefore, you should call a cup of ice tea and pickled vegetables with noodles to reduce boredom. Just like other ‘pho’ shops, rice noodles here are always accompanied with a plate of raw vegetables and pickled green papaya. Besides, the shop also serves cucumber slices to customers. Nonetheless, stir-fried ‘pho’ here is quite expensive but modest, just fit enough for women. In fact, the meat here is very little, so many customers who come to the shop have to call a bowl of bare cows. Overall, expensive but delicious and due to the central location, this ‘pho’ restaurant is one of the most favorite places for those who want to enjoy stir-fried ‘pho’ in Hanoi. Phu My fried noodle shop at 45B Bat Dan is always crowded with consumers. The secret behind that is the salty and sweet sauce soaked into each noodle fiber, mixed into the vegetables with beef, making this dish more special than everywhere. Stir-fried ‘pho’ here includes plenty of beef, many different kinds of green leafy veggies, accompanied by sweet mango sauce and fresh vegetables. So, even though the price is quite higher than the popular shop, this restaurant is still favored by many people. This restaurant has been open for years, and it sells all day, both of which are enough to prove the attraction of this noodle shop. Actually, this is known as one of the best restaurants for those who want to try the taste of stir-fried ‘pho’ in Hanoi. When it comes to finding ‘pho’ restaurants where sell stir-fried ‘pho’ in Hanoi, you should not forget this place. The noodle soup on Cua Bac Street is simpler and more pure. At peak hours, you can witness the crowded guests with the restaurant’s professional working style. The shop’s small side overlooking Nguyen Truong To Street is an industrial kitchen. There are always a few staffs always stir- frying and making dishes. The larger side overlooking Cua Bac Street are full of guests along both the house and the sidewalk. The ‘phở’ here is usually pre-processed, and filled up in large pots. When the customers call, the staff will quickly stir fry the noodles once again. The taste or raw materials are not very special, but stir-fried ‘pho’ on Cua Bac Street is hand processing, tasty and professional service. The dishes of noodle are also full, and plenty of meat. In addition, many customers like this noodle shop due to its rich menu. Apart from stir-fried ‘pho’, this noodle shop also serves fried rice, fried noodles, French fries, etc. All of these dishes are also delicious with affordable prices. Now, in Hanoi, there are some places where you can enjoy stir-fried ‘pho’. Each restaurant has a different flavor, so you should consider visiting some of these restaurants to determine your preference. Actually, this dish is worth trying if you have a chance to visit Hanoi or if you are a fan of ‘pho’ and looking for something different. This dish is so delicious and attractive and if you have a chance to try it, you will love its taste and never regret about your choice. Now, let’s go to any of these restaurants and enjoy this delicious dish with your friends and family members, and feel free to come back to VinaFood if you want more interesting food guide!